Stacy, Lily is just beautiful and I know ya'll are having the best time loving on her. I do hope your mom is healing and how wonderful to start a blanket just for your Mom. 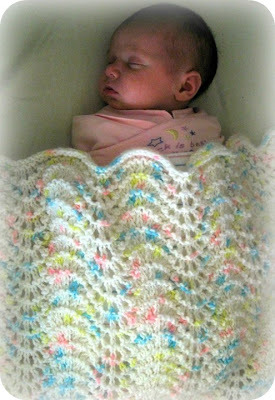 The blanket you made for Lily is very pretty and I love the pattern. Oh how gorgeous, the blanket AND Sweet Lily! Don't you just love kissing those sweet cheeks? I also have a new appreciation for hand knit blankets. So much love and work goes into them. I love the feather and fan pattern. So beautiful. A beautiful blanket for a beautiful baby!!! Awww, Lily looks so sweet with her new little auntie-made blanket. I love making afghans -- just haven't really made one since I started quilting. I've been really wanting to do a big cable though....maybe... Have fun picking a pattern and choosing yarn! What a pretty blanket and equally pretty niece. Get on it and get a blanket made for your Mom. My grandmother used to crochet and I have about 10 blankets from her. We love them. Amelia has her own too. They get a lot of use. 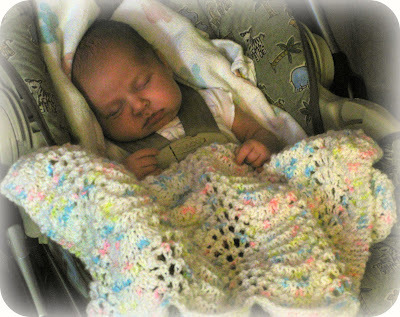 Awww what a little doll Lily is in the pretty blanket you made! Lily is so gorgeous and I love her name! Sweet and old-fashioned. The blanket is beautiful. I, too, love the feather and fan (you taught me how to do it). 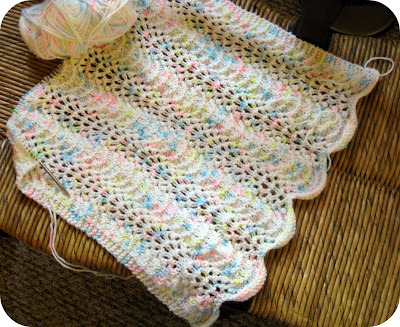 Hmmmm...a baby blanket in feather and fan...now who do I know who's having a baby and would need a blanket? I hope your mom is doing better. And I agree with her - a blanket made by someone you love is much more comforting! Your blanket is just gorgeous..and it is super special because you made it for your niece! Oh the blanket and your niece are so precious! She is lovely and looks so content wrapped up in your blanket. What a touching story about your mom, too. What comfort from our handmade things. I hope you make it to the beach. We have been a couple times. It's hot here in OH and we may head there today!